Luum Textiles today announced the launch of its latest collection − Woven Logic. Woven Logic highlights anomalies in automated structures and celebrates weaving from simple, plain and basket weaves along with more complex constructions. 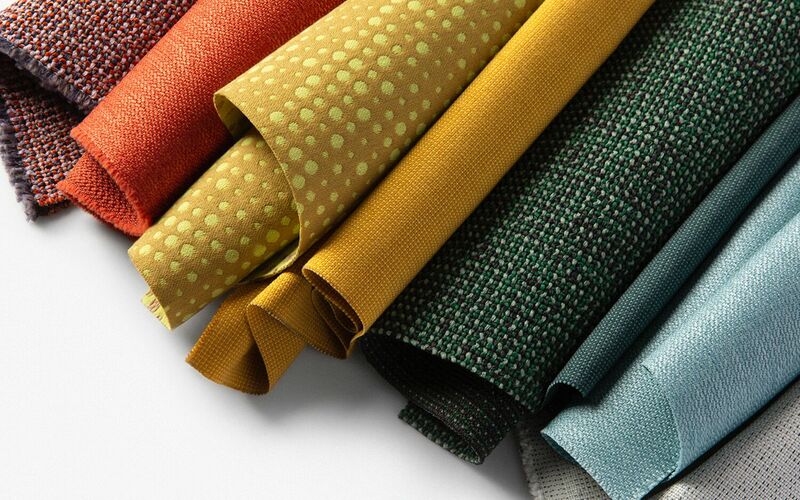 The four new fabrics – Point Set, Elastic Wool, Bitstream and Adage – plus the recolored Percept feature these hidden complexities within inherently durable material constructions. Each fabric represents an exploration in fiber development with sophisticated color palettes. relationship between early jacquard looms and our experience of today’s digital world. The coding language of 0 and 1 can be traced directly to the binary system of weaving, harnessed by jacquard technology during the industrial revolution. Highlighting the innovation that can be achieved through manufacturing partnerships, Elastic Wool repurposes existing manufacturing technology in response to current needs in the marketplace to create an entirely new material. Today’s curvilinear furniture presents new challenges for textile application. Bitstream’s balanced weave harnesses the relationship between the structured and the idiosyncratic. Solution-dyed black polyester is twisted with undyed polyester and woven systematically throughout an otherwise simple structure. This multi-purpose fabric addresses needs for vertical and upholstery uses. Adage brings hand-woven techniques to industry front lines. Material and color are intertwined in a deceptively simple and balanced structure, creating a multi-color texture with an enhanced visual effect. This satisfyingly chunky texture comes in 21 colors. The versatile recolor of the classic multi-purpose Percept fabric now offers an extended palette of 27 colors. Sophisticated as a vertical fabric, its heavier weight and elegant textural surface make Percept perfectly suited for upholstery use. Percept is designed for use as upholstery, panel and wrapped wall.